Thanks for stopping by and visiting! I'm happy to have you here. 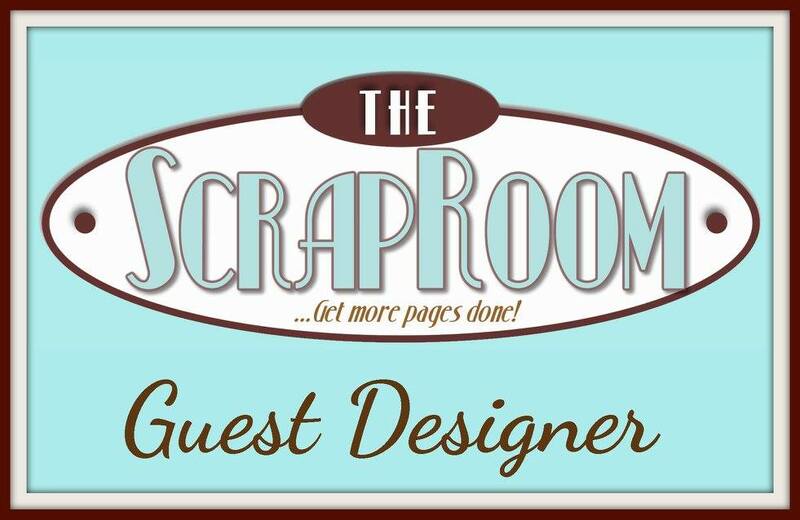 I was able to get scrappy yesterday and I have a layout to share with you today. 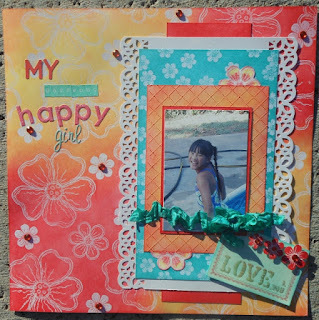 I was inspired to do this layout by the So You Think You Can Scrap Challenge that I have been doing at Colorful Creations. This one is for round 8. We were required to make our own patterned paper. 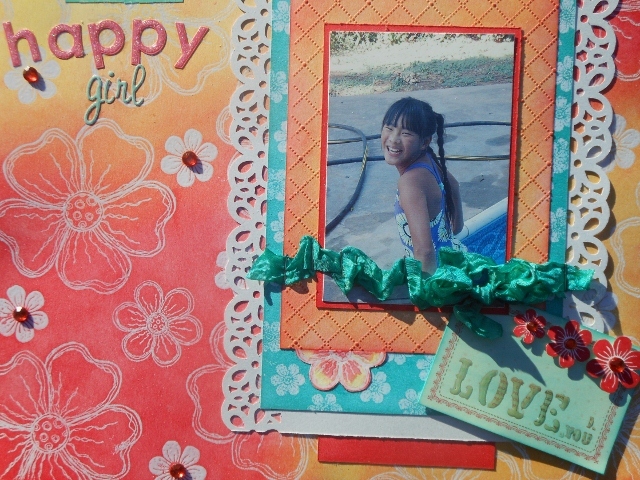 I made all the patterned paper on this layout. 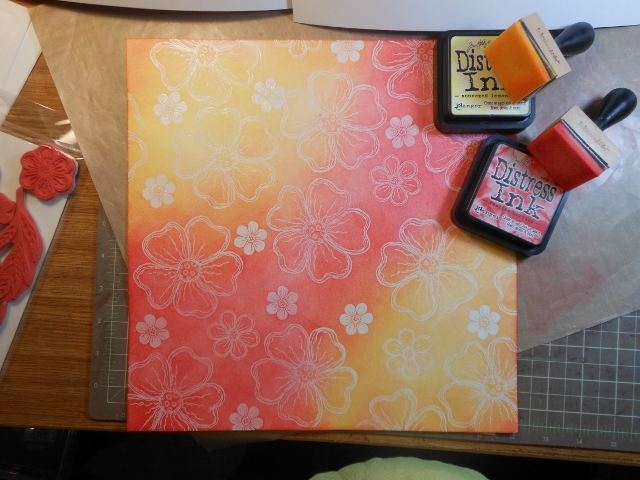 For the base paper and the turquoise paper I grabbed my new Sheena's A Little Bit Sketchy EZMount Stamp Set - Flower Power. This is an awesome 9 stamp set! I started out with my favorite paper. Yes, you know which paper I'm talking about...Luxury Centura Pearl Printable Snow White Cardstock!! That is the paper I was raving about yesterday! lol I flipped it over and used the non shiny side of the paper. 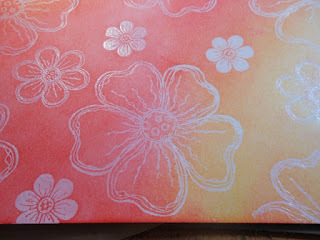 I stamped out 3 sizes of flowers randomly all over the paper using VersaMark ink. Then I heat embossed it with clear embossing powder. Then I pulled out my Ranger Distress ink pads in Squeezed Lemonade and Festive Berries. I was inspired to use these two colors by the cover of a child's clothing catalog that sitting on my desk. I just loved the outfit the girl was wearing and it was in these two colors. You really can find inspiration everywhere! Using my inking tools, I rubbed these two colors of ink all over my embossed paper. The cool thing is that the embossed lines resist the ink so you get a very distinct pattern. I kind of went a bit crazy with the flower stamps because they are all so cool. I used the smallest flower to make my turquoise paper using the same technique as on the base paper. I also stamped out a medium flower, heat embossed it with clear embossing powder and then I colored it with the inks from the same two Ranger distress ink pads using a water brush. Then I fussy cut it out and cut it in half. I also stamped out 3 flowers in graduating sizes with Festive Berries Distress Ink and fussy cut them out to use as embellies. 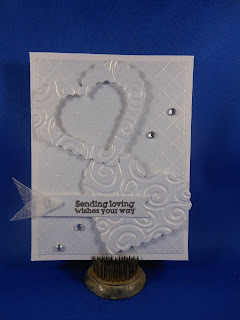 I was able to use one of my new Darice embossing folders on this layout too! I grabbed my 4.25" X 5.75" Darice Embossing Folder - Wire Fence and ran it through my eBosser, then I inked over it. I love the texture it brings to the layout. I inked white crinkle ribbon with my Spectrum Noir BT5 ink refill, scrunched it up and used my heat gun to dry it. 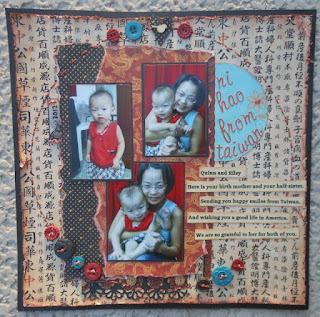 I used a sketch challenge from Artful Delight to inspire this layout but was too late to enter it in their challenge. But it was a fun sketch and I'm happy I was able to use it. 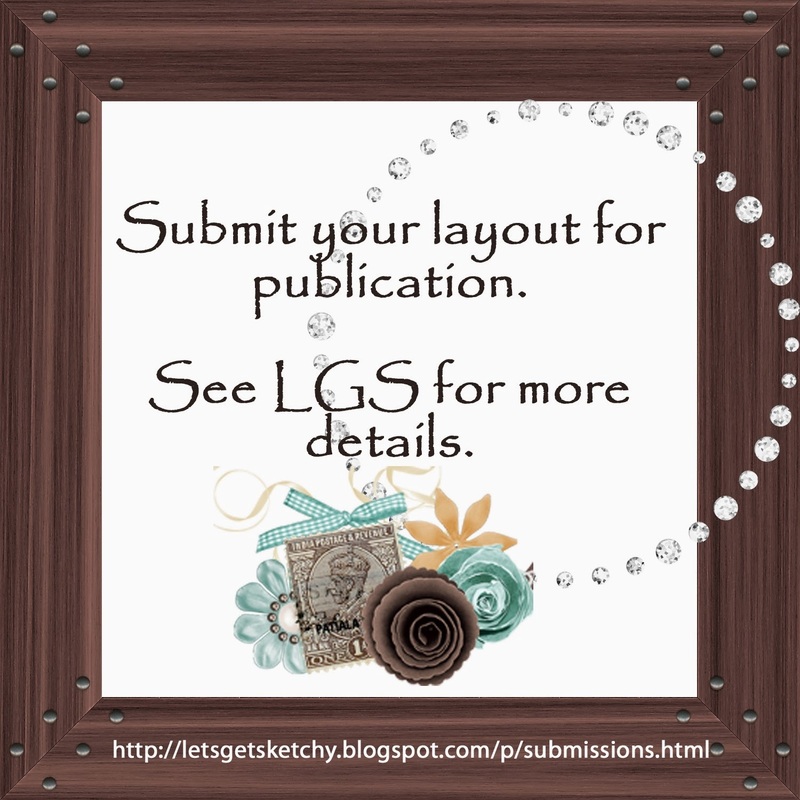 I am entering this layout in the Be Bold challenge at Frosted Design. And finally remember you only have one more day to enter the February "Love Is In The Air" challenge at Crafter's Companion. 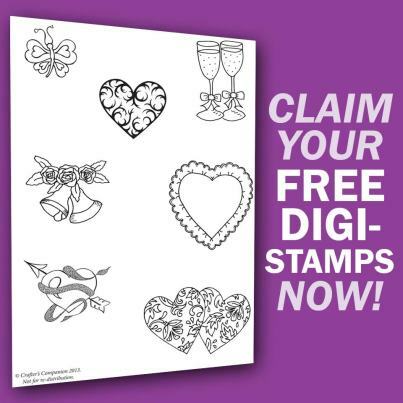 If you haven't entered already, you better get cracking! 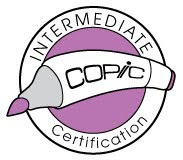 There is a $30 gift certificate up for grabs. Hello everyone. I hope you are having a nice Tuesday. The sun is shining here in Las Vegas today. It is a bit cool but it is nice. How about you?? 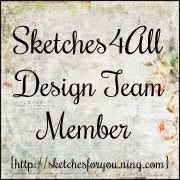 I have a new card challenge up at Sketches4all and it is to make an all white card. 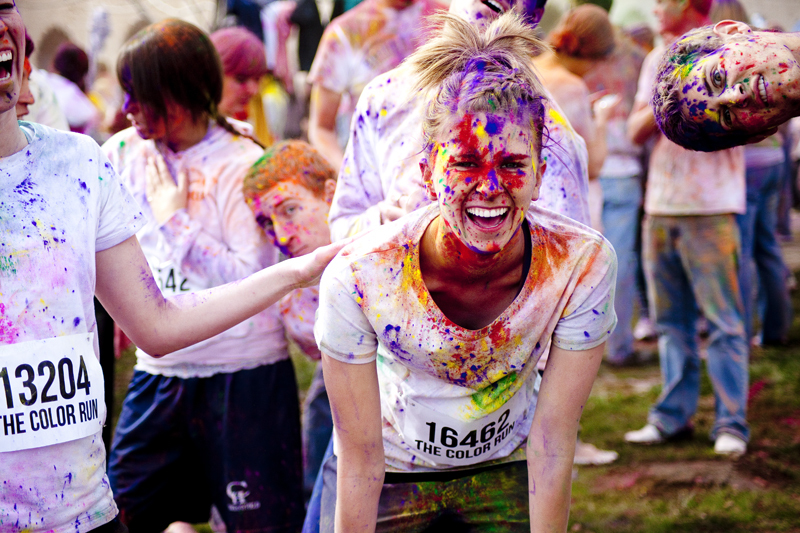 Only the sentiment can be in color. Have you ever made an all white card? I hadn't until yesterday. First time for everything I guess. I made a base card and then I trimmed a second piece to be just a bit smaller than the card. I pulled out my new (shhhh don't tell my hubby! ha) Darice -Wire Fence embossing folder that I just got yesterday in the mail from Crafter's Companion and ran that trimmed piece of paper through my eBosser. Then I adhered it to the base card. 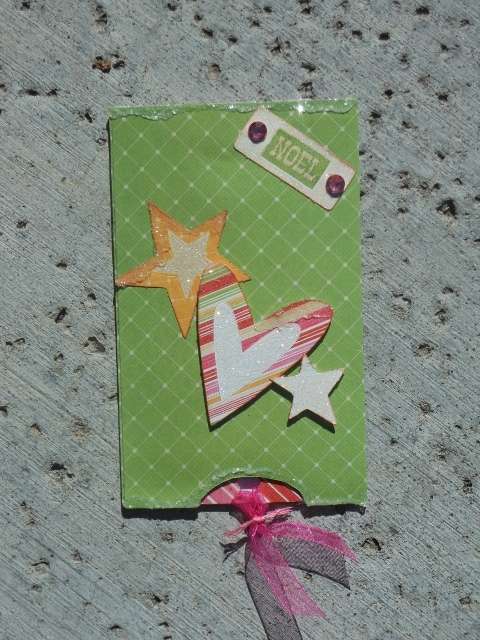 Next I grabbed some hearts that I had die cut out previously for another project and didn't use. (in fact, one of them is the waste from one of my projects!) I grabbed a Sizzix embossing folder that has swirls and embossed both hearts in my eBosser. I used double sided adhesive squares to attach them to my card. Then to finish it off I stamped out with VersaMark ink a sentiment from the recently released Angelica & Friends Collection - Felicity stamp set. 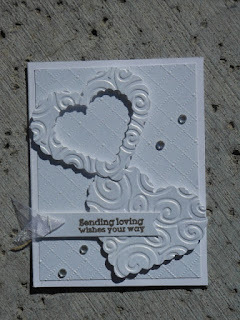 I heat embossed it with some silver Martha Stewart embossing powder I had in my stash. I stapled on a bit of white ribbon with my Tim Holtz Tiny Attacher and then used a bit of white out to make the staple white. (hey it worked!) ha And I had to have a bit of sparkle so I threw on a few clear gems. What do you think for my first all white card?! I think it turned out pretty great and it would be perfect for the Crafter's Companion February Love is in the Air challenge that is going on right now!! 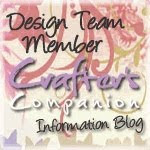 You still have a couple of days to enter to win the $30 gift card to Crafter's Companion! I also have a card that is a Pulley Slider Christmas Card that I made using my Ultimate Tool. 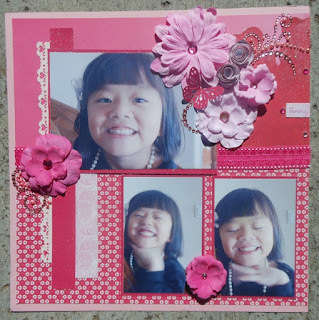 I love to make these cards because they are fun and easy. 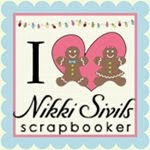 You can find step by step directions on making this kind of card on The Ultimate Christmas Project DVD. 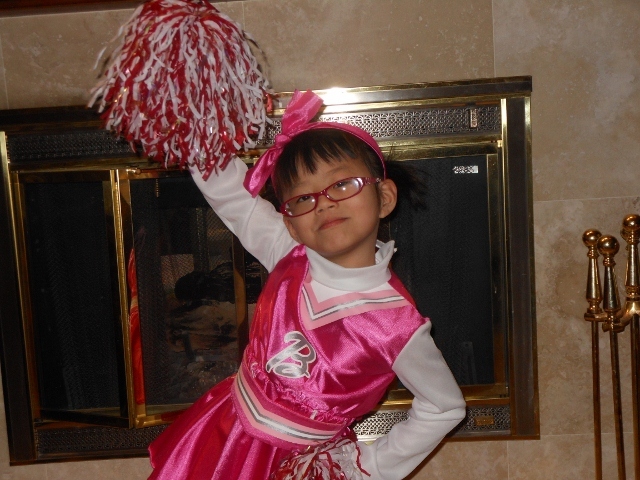 Okay, this is getting long so I will end here with a photo of my sassy daughter working her cheerleader outfit. Because everyone can use a smile right?? My best friend, Denise from Lala's World blog is having a blog candy giveaway that you are going to want to try to win! Look at all the goodness!! 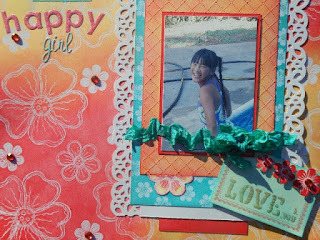 This blog candy includes the New Sheena Douglass EZ Mount Wouldn't-It-Be-Lovely-1, two Popcorn and Friends, Sheena's Paint Fusion Rose, and Sheena's Paint Fusion Garland. 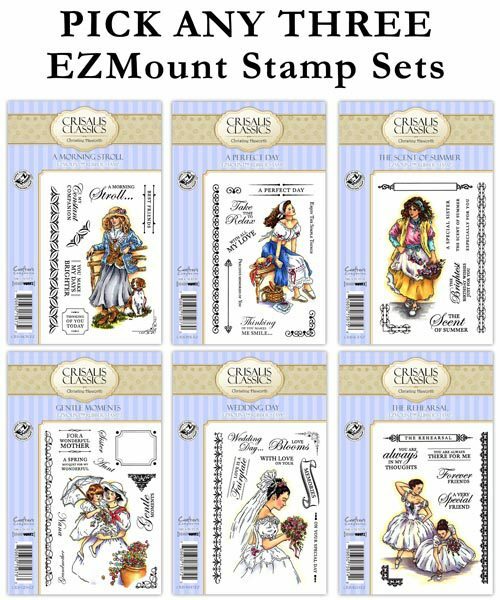 There are a couple of Make It Crafty and Imaginese stamps as well. The flowers are from Prima. Do you want these AWESOME STAMPS worth over $60? She will pick the winner using random generator on February 28th so your better hurry up and go check it out! 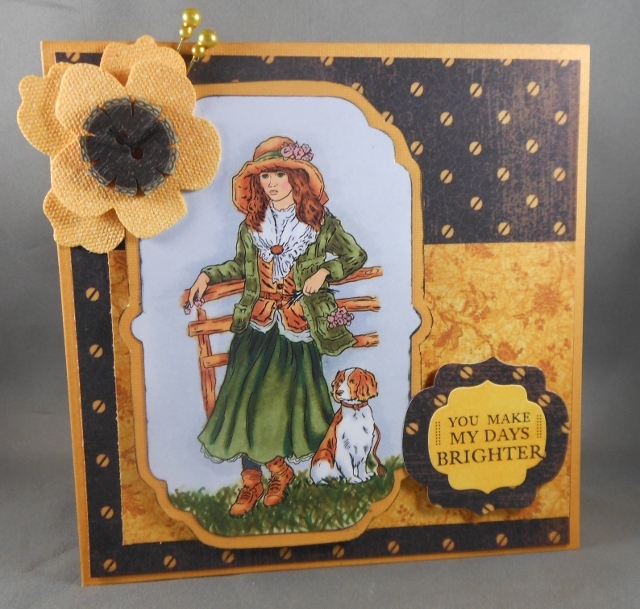 Today Crafter's Companion is launching a stamp collection called Crisalis Classics. This is the next installment in the popular craft range from well-loved illustrator and figurative artist, Christine Haworth. The images are gorgeous and you are going to love them. 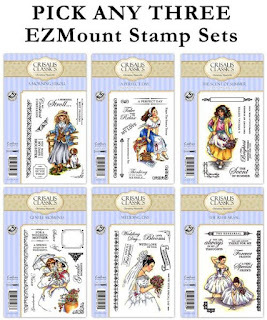 I decided to us the Crisalis Classics EZMount™ Stamp Set - A Morning Stroll for my card today. 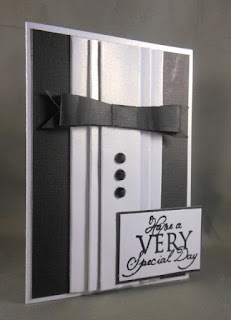 I stamped her out on a piece of Ultra Smooth Premium White Cardstock using Tuxedo Black Memento ink. I colored her with my Spectrum Noir markers of course. I die cut the image and sentiment out on my eBosser and then layered it on my card base with my coordinating pattern papers. I think this stamp is just so pretty. Be sure and go check out the whole collection. They are having special "launch" pricing and you won't want to miss out. 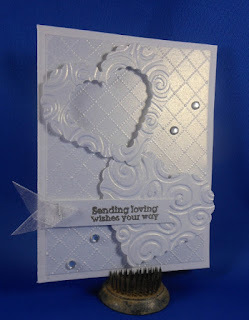 And if you haven't already joined in on our Crafter's Companion Love is in the Air challenge you need to get busy!! You could be the lucky winner of the $30 Crafter's Companion online store gift card! Thanks for stopping by and looking today. 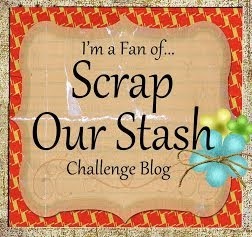 Until next time...happy scrapping!! I had so much fun doing the Las Vegas Color Run this weekend with my best friend and 4 of our kids. 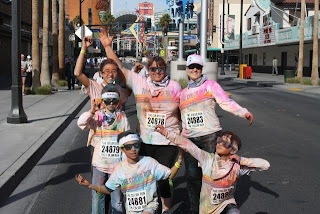 We really had a blast so of course I had to do a layout with one of the photos we took at the end. I've been doing the So You Think You Can Scrap challenge at Colorful Creations and have made it to round 8 so here is the layout I made for this challenge. The challenge this week is to use the sketch, use blue, red, yellow and green only (bright, primary ish colors), hand sew, mist, and fussy cut. I followed the sketch and I used all 4 colors. I misted the yellow paper on the upper right hand side with yellow Jingle Bells Glimmer Mist but since it didn't show up very well I also misted the whole layout with Iridescent Spray and Sparkle (love this stuff!!!). 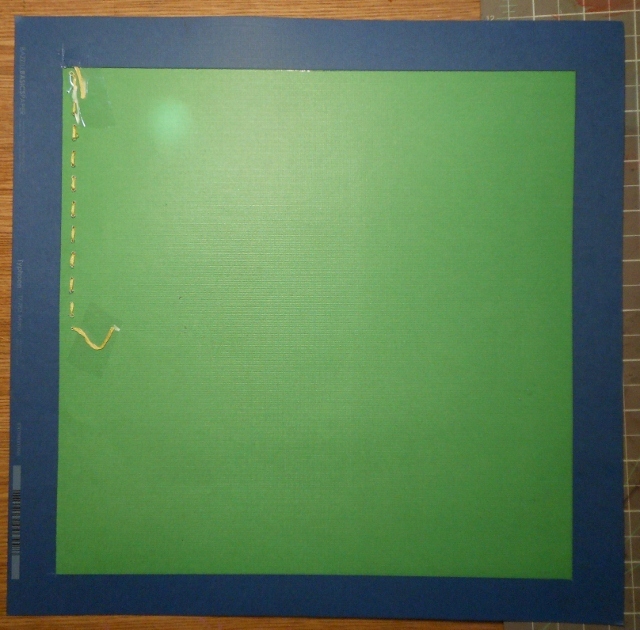 Here is a little tip that is a super simple idea but saves you a ton of paper. 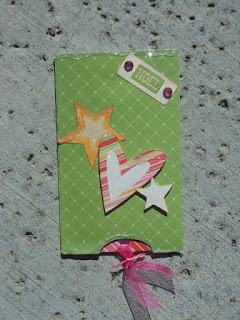 When you are layering paper on a layout (or card) you can cut out the middle of the paper that is the bottom layer. It is easy to just measure in about an inch or however much works for your project and then cut it out with your paper trimmer. You then can adhere the paper on top and no one will even know that the middle is missing from your bottom paper. For my fussy cutting, I stamped out two flowers from the Stamp It Holiday-Poinsettia stamp with Paris Dusk Memento ink onto red card stock and then fussy cut them out. Next I layered them offset on my layout using double sided adhesive squares to adhere one of them a bit higher than the other one. I also stamped out a swirl from the Sheena A Little Bit Scenic - Flying Colors stamp set with the same ink onto blue card stock and fussy cut it out too. 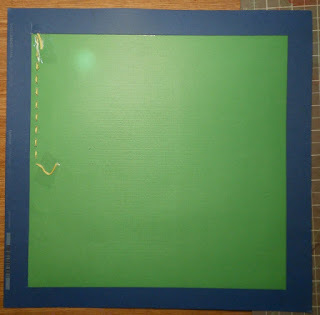 I also used the double sided adhesive squares to adhere it to my layout. Fingers crossed I make it to round 9!! 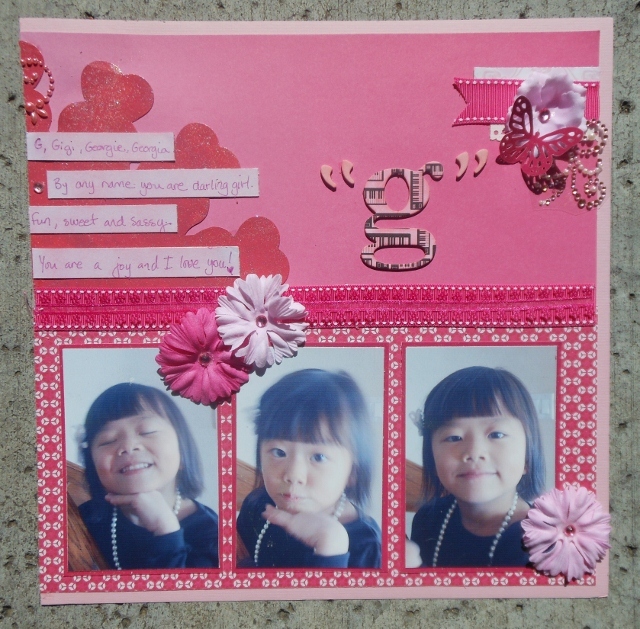 lol I am also entering it in the Anything But a Card Challenge at The Cheerful Stamp Pad. My BFF and her family left to drive back home this morning. I'm going to miss them. It was a great weekend. I hope you had a good weekend too. Thanks for visiting. 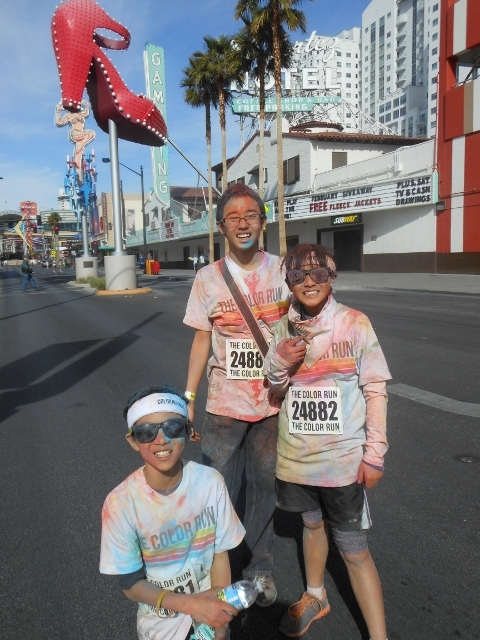 We survived The Las Vegas Color Run!! WOO HOO!! lol It was a blast! And it went faster than I thought it would. My kids are already asking to do it again. 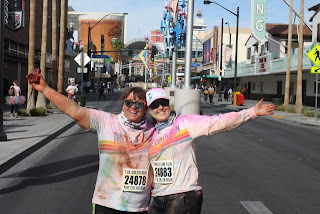 ﻿Here we are at the finish of the race. 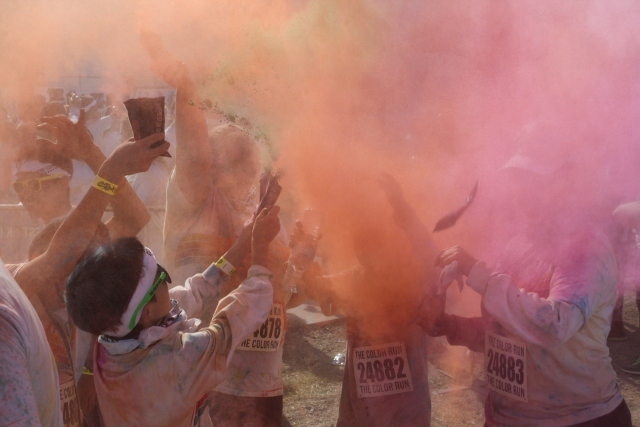 There were 4 "Color Zones" that we ran through and then at the end you each have a pack of color to throw in the air. It was really a great time! ﻿I'm so glad that we did it and now we can check "do a 5K" off our bucket list!! LOL I bet we will be doing more and more of them. Last night we watched Lincoln and Zero Dark Thirty. I liked both movies but liked Lincoln best. ZDT was good but a bit slow and long and there were torture scenes that were a bit difficult to watch. But both movies were good and worth seeing. If you haven't seen Silver Linings Playbook, I think you should run out and see it immediately! It is fantastic. It is hard to explain but it is funny, sad, touching, romantic, crazy and you leaves you feeling good. I can't say enough about it. I do have good news for me. I made it to round 7 of the So You Think You Can Scrap challenge at Colorful Creations. Woot! Here is my double layout. 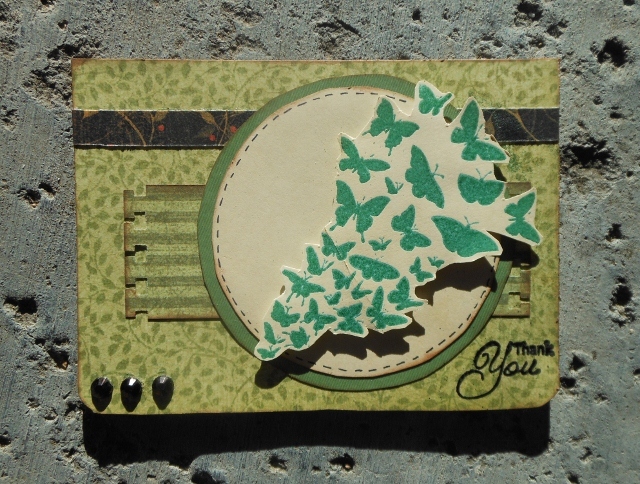 It had to follow the sketch closely, be monochromatic, use a die cut, use a border punch, have a butterfly on it, and have two homemade flowers on it. Phew! But I did it and here it is. I didn't have a pink die cut so I painted the one I had and the put some champagne Glitter Glam on it. I made the two rolled flowers. You can see the edge punch next to the larger photo and I punched butterflies out of pattern paper and you can see that I chose pink as my color. Okay, I'm going to finish up here and go scrap. Thanks for stopping by today. I would love it if you left a comment. It is always fun to read comments! ha Until next time...happy scrapping!! Also, be sure to go to the Crafter's Companion Blog and check out the awesome tutorial that Jennie Black has to share today. While you are there check out what else Crafter's Companion is doing today to help make your Valentine's Day even sweeter!! Here is my Valentine's card for you. I made it using a Crafter's Companion - Stamp It Imagine - Sentiment Swirls Stamp and inspiration from the Onlinecardclasses.com Clean and Simple 2 class I just took. If you are interested in knowing how to make this card you can check out my previous post where I have a little tutorial that walks you thought it. I hope you all have a fantastic Valentine's Day!! Go out and share the love!! First the card. 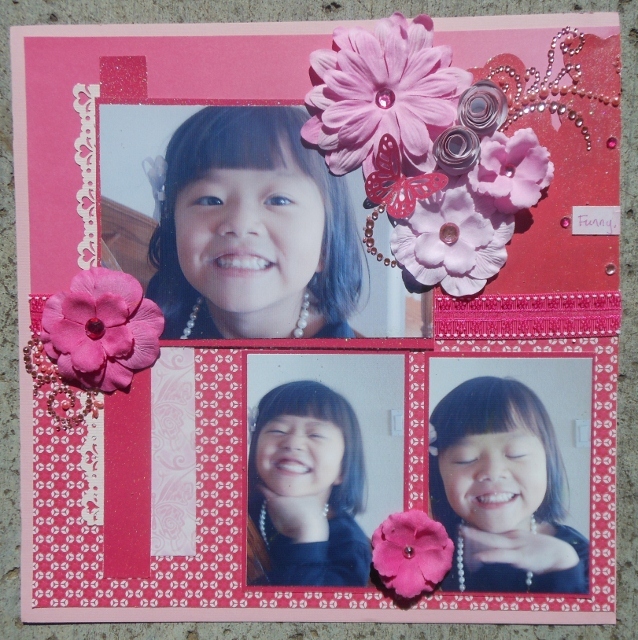 On day 10, Jennifer made the cutest card using die cuts and stamps. 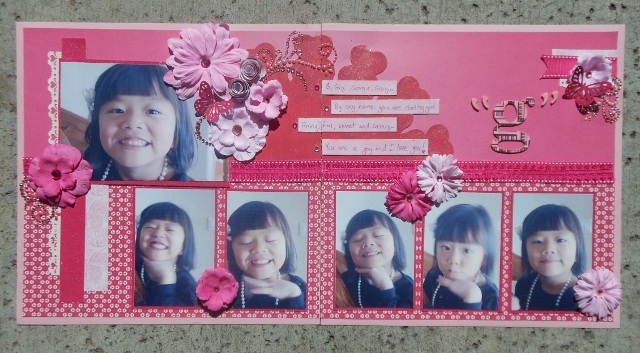 I was inspired to use my die cuts and a Crafter's Companion Stamp It Australia EZMount Stamp Set 60 - Friendship Sentiments stamp. I took the excess and trimmed it slightly smaller than the front of my card base. 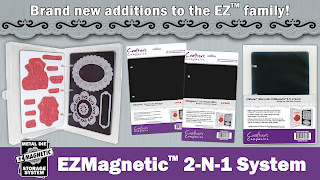 Then I grabbed some heart dies from out of my new EZMagnetic EZBinder. I'm loving this new binder for my dies. It holds a ton of dies on the magnetic sheets and snaps closed for easy storage. I die cut two hearts from the Luxury Centura Pearl panel that I had prepared. I actually layered them, one inside the other. I kept the smaller heart and tossed the excess paper aside. So now I have the die cut front panel and a small heart. The pink heart was just sitting on my scrap desk so I slipped it underneath just to give some contrast so you can see the pieces. The heart with the hole in it can be put aside and used on another project later. I found some gray shimmer paper in my stash and cut it slightly larger than the larger heart shape cut out of the front panel. I centered it behind the heart on the panel and using a piece of EZRelease Tape, I adhered it on the front of the panel. Then I turned the panel over and put some adhesive on it and centered it on the card base and pressed down. After it was adhered to the card base I peeled off the EZRelease Tape. I don't want the die cut panel added to the base card just yet because I want to wrap some red ribbon around it and add some double sided adhesive squares to the back so it will stand up off the card. So I do this next. Next I pulled out my stamp and stamped my sentiment quote with VersaMark ink and using some red embossing powder. After I heated it and it cooled I put the double sided adhesive squares on the back and I colored a few clear gems with the CR11 Spectrum Noir pen to color coordinate. Now I just added all the different parts to the base. I centered the front panel and adhered it to the base card. Then I centered the small heart in the window and adhered it to the gray paper. I randomly added the colored gems at this point and glued down the bow I made on my Ultimate Tool to the ribbon on the panel. 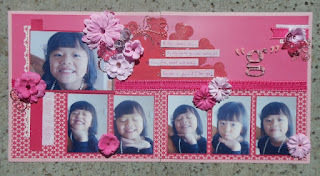 I'm entering this in the challenge at CAS on Sunday and in the challenge at Come and Get It Challenge Blog. Next I want to share an altered/recycled project. My son needed a decorated "mailbox" to put his Valentines in at school next week. I took an empty cereal box and made sure the bottom of the box was taped shut. Then I pulled out some shiny black card stock and covered all sides the box and the bottom. Then I took a piece of that Luxury Centura Pearl 8.5" x 11" Printable Snow White Card stock (I told you I was loving this paper! lol) and cut it to the same size as the front of the box. Then I pulled drew a light pencil mark down the vertical middle on backside of the paper. I pulled out my Ultimate Tool and my Boxer board. And using the inches side of the boxer board, I butted the pencil line up to the handle side of the Ultimate Tool and scored at 1 inch, 1/2 inch, 1 inch, 1/2 inch and 1 inch. Then I flipped the paper and did the same scoring along the other side of the pencil line. There was a little extra bit on the edge and I trimmed this off of both sides. Next, making sure to first fold to the back, I accordion pleated the paper along the score lines burnishing each fold. After it was all folded I laid it down on a piece of card stock and put pencil marks to measure the length and width. I trimmed the card stock down. Then I added some adhesive to the card stock and a line of double sided adhesive squares down the vertical center. I grabbed my pleated paper and pressed the edge down along the edge of the card stock. I turned the paper and lined up the other side of the pleated paper and pressed it down on the other edge of the card stock. Finally I pressed down from the middle on to the double sided adhesive squares while making sure my pleats were even. To make my pleats look like the front of a tuxedo shirt I added 3 brads for "buttons" before I adhered it to the card stock. There are dies on the market that make a nice bow but I don't have them (yet ;-) ) so I just have to be a little more resourceful. I cut two pieces of paper about 1" x 8". I folded one in half and put adhesive on the back in the middle. Then I folded each side to the middle. Next I trimmed each side toward the center to make more of a bow shape. I took a scrap piece of the same paper to wrap around the middle and adhered it in the back. To finish up the bow, I took the second piece of paper and trimmed it down the approximately the same shape (you don't have to do this step) as the bow and then cut the ends into a banner edge. Then I glued down the bow on top. Here is the other side of the box. I'm going to enter it in the challenge at Challenge 4 Everybody. That is it for me today. I hope you weren't bored to tears. lol Thanks for hanging around to the end. Okay I'm off because today is the day we get new episodes of ....The Walking Dead!! I can hardly wait! ha. I need to get all my kids fed, bathed and in bed by 8pm so that they will be asleep when it starts at 9pm. 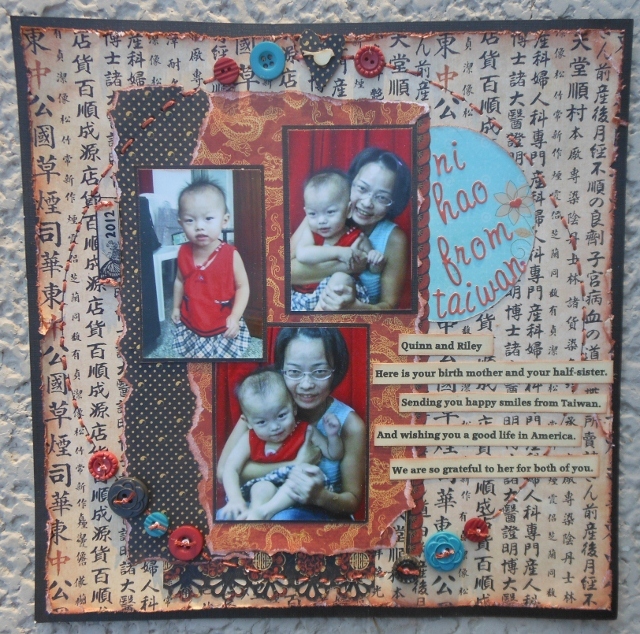 I made it to Round 6 of the So You Think You Can Scrap challenge over at Colorful Creations. WOOT!! The challenge this week is a doozy. I will have to think about it for a bit before I can actually get started. I wanted to share the layout I made for challenge 5. This challenge was a sketch challenge. You also had to distress it. You had to tear something and you had to recycle something. I distressed all the papers. I tore the edges of the two papers under the photos and my blue circle is recycled from Bo Bunny packaging. I had fun adding stitching to this layout. I actually really like to hand sew stuff. I don't know why I don't do it more often. I'm sure it has something to do with having the time to do it. I used to cross stitch all the time before I had children. But that is such a time consuming craft. Anyway, I'm happy with how it turned out. What do you think? I also have a card to share with you. 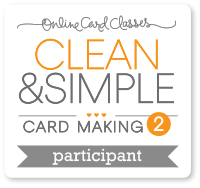 I'm have been taking an online class, from Onlinecardclasses.com, which you probably know if you follow me regularly. And our homework for day 9 was to" add texture to your next card". Here is my take on that challenge. I tried to add texture on this card in two ways. 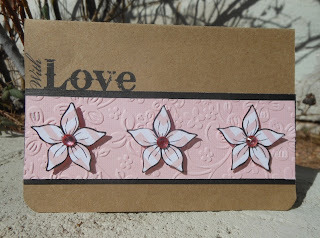 One way was that I dry embossed the pink paper using my Darice - Floral Frenzy embossing folder. Sheena Douglass recently came out with some really great new stamps in her A Little Bit Sketchy collection and I just had to use one of the flower stamps from her Always Floral stamp set. 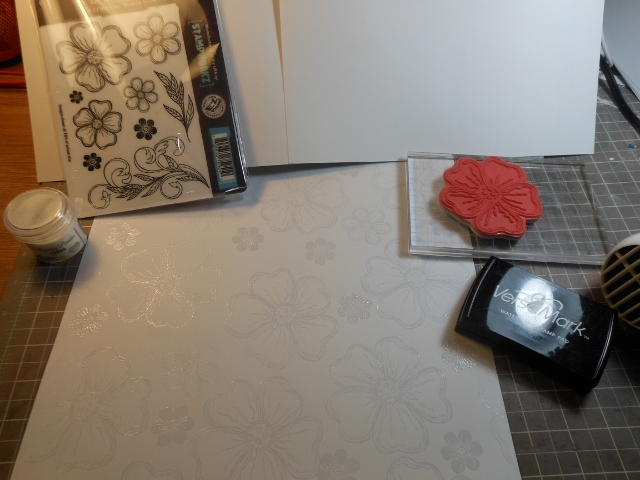 I stamped out my flowers onto some patterned paper and fussy cut them out. 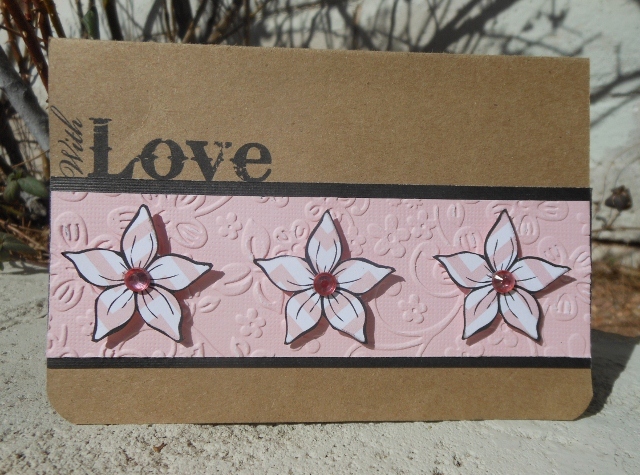 And the second way I added texture was by using my double sided adhesive squares to pop those flowers up off the card. I really love the simplicity and dimension. The sentiment was stamped with my Sheena's A Little Bit Sketchy EZMount Stamp Set - Only Words - From The Heart using Tuxedo Black Memento ink. Today I was lucky enough to get to spend the whole day watching my daughter play lacrosse. Her team hosted a tournament and the girls played in 3 different games. It was cold and windy but that didn't stop them from doing their best and ending their season on a high note. My boys start their lacrosse season in two weeks. So I get one week "off" before we start having two games a week in addition to practice 3 days a week. Lacrosse 5 nights a week...sigh...I hate to say it but I'm tired of lacrosse already just thinking of all of that!! LOL Don't tell my kids! Well we are having family movie night - Hotel Transylvania so I'm going to end here and go join in the fun. Thanks for stopping by and looking today.